$3 million from Dave Short, Class of 1981, and his wife, Beth. $2.5 million from the Smiley Family Charitable Foundation, led by Ray Smiley, Class of 1951, and his wife, Eleanor. $2 million from Campaign Co-Chairs Rich and Chris Kramer from the Class of 1986. $1 million from Bob Heltzel, Class of 1970, and his wife, Heidi. The Heltzels’ generous gift also includes a prized collection of Abraham Lincoln and Civil War Memorabilia. $382,500 from Campaign Co-Chairs Dan Frate, Class of 1983, and his wife, Laura. A $6 million gift from Tim ’71 and Jayne Donahue of Palm Beach Gardens, Florida, in support of scholarships for current and future low-income John Carroll students who have demonstrated academic excellence and a commitment to service. Recipients of the financial aid award will be known as “Donahue Scholars.” Their contribution is one of the largest gifts, to date, to the Forever Carroll Campaign. An anonymous bequest of $4.45 million to help deserving students in need of financial assistance. It is the largest anonymous gift commitment by an individual in the history of the University. A $2.5 million gift from alumnus Robert W. Gunn ’69, and his wife, Marianne, of Marblehead, Massachusetts. 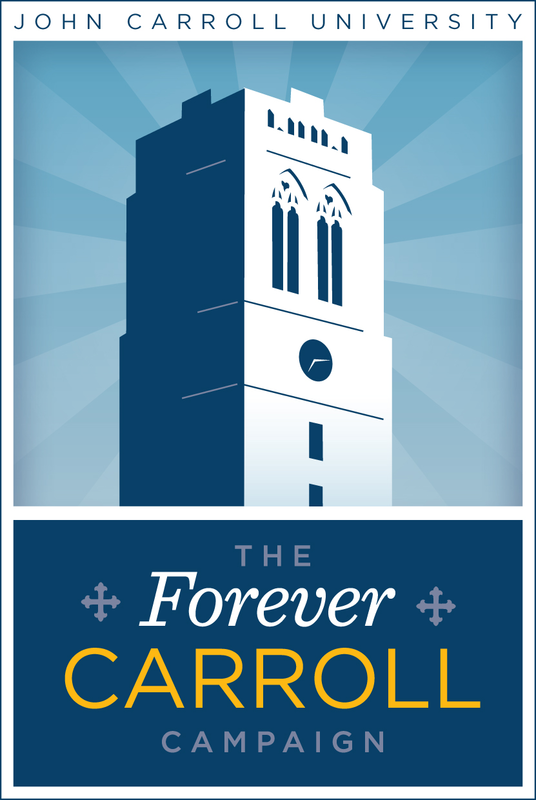 Their unrestricted gift will support the comprehensive goals of the Forever Carroll Campaign. John Carroll is the only private college in Ohio and one of only two private institutions nationally to be selected to participate in the Woodrow Wilson Ohio Teaching Fellows Program. The Fellowship Program is designed to attract talented and committed individuals with backgrounds in the STEM fields – science, technology, engineering, and mathematics – into teaching in high-need secondary schools. The John Huntington Fund for Education awarded John Carroll a $1 million grant in 2012, and a $275,000 grant in 2010 to support scholarships for academically talented but financially disadvantaged students from Cuyahoga County. In June 2013, John Carroll received a $210,000 grant from the Kulas Foundation in support of renovations to Kulas Auditorium, one of the oldest structures on campus. Visit the Forever Carroll Campaign website for the latest Campaign updates and additional gift announcements. We the People, the Center for Service and Social Action’s (CSSA) service-learning program dedicated to educating Cleveland students about the Constitution and citizenship, was awarded a $50,000 grant from the Honor Project Trust in 2014. The Boler School of Business was awarded an Undergraduate International Studies and Foreign Language Program (UISFL) grant in 2014. John Carroll University received a $147,933 Career Ready Internship grant from Great Lakes Higher Education Guaranty Corporation for the 2014–2015 academic year. The funds will be used to establish 38 new paid internships for juniors and seniors in the College of Arts and Sciences who receive financial aid. The McGregor Grant: In 2011, Jeanne Colleran, Ph.D., dean of the College of Arts & Sciences, was awarded a three-year, $236,000 grant from the McGregor Fund in support of the project “Engaging the World: Educating for Contemporary Global Citizenship.” Led by project director Pam Mason, Ph.D., associate professor of political science, the project developed contemporary, integrated, and interdisciplinary curriculum with a strong emphasis on global education and social justice. For more information, visit sites.jcu.edu/mcgregor/. Professional Development for Teachers: The Center for Mathematics and Science Education Teaching and Technology (CMSETT) received over $350,000 for several grants since late 2010 in support of teacher education projects. Led by directors Linda Gojak and John Milam, these grants included $167,661 from the Ohio Department of Education for the multi-phase project “Using Technology with High School Teachers and Students to Develop the Standards for Mathematical Practices” and $189,200 from the National Science Foundation working with the Cleveland Metropolitan School District on the multi-institutional project “Cleveland Mathematics and Science Partnership” to promote teacher education. Paul Nietupski, Ph.D., professor of theology and religious studies received a Freeman Student-Faculty Fellowship from ASIANetwork, which provided travel and research funds for him and four students to conduct research projects in Sino-Tibetan borderlands. Funding for this competitive program was based on the quality of the student projects submitted with the application. For more information, visit the JCU Newsroom. Susan Long, Ph.D., professor of anthropology, received a grant from the Japan Foundation Center for Global Partnership to conduct the student tour “Popular Culture in Times of Crisis.” In addition to research and study, students participated in a service project while in Japan, volunteering in the area affected by the March 2011 earthquake. Peifang Tian, Ph.D., assistant professor of physics, received a two-year award from the Research Corporation for Science Advancement for the project “Modeling the Light Propagation in Brain Tissues Using Monte Carlo Simulation with a Dynamic and Heterogeneous Tissue Model” which included funds for an undergraduate student research assistant.